As I landed at Tegel airport and made my way to find a person I had never met before on the roads of Berlin, less did I know that I was going to have one of the most rich and inspiring experiences of my life. Under the vigorous and motivating leadership of Ilja Sichrovsky, 43 people from all across the globe gathered to prepare and run the MJC 2016 for 110 participants from more than 33 countries. These brave and beautiful souls shared tears and laughters as they shared their journeys and their aspirations to complete strangers they met for that one week in Berlin. Strangers, who, as the week progressed developed familial bonds among each other. From people working on entrepreneurial projects to people who had survived horror tales, I cannot pinpoint what inspired me more. There is something transcendental in meeting someone from the ‘other’ side. We keep reading about the beauty in diversity. The harmony in religion. And yet we keep drowning back into our personal and social status quo. Seeing the participants experience the magic of meeting someone from the other side surpassed everything else as their preconceived stereotypes took the biggest hit. Chairing the Project’s Committee I learnt that despite the abject trajectory of world affairs, we’re surrounded by bold initiatives led by amazing groups of individuals – ones that are simply a conversation away. They have the goodwill and the skills to make real positive change, but they need our help. MJC brought these amazing people together to ignite that spark of community, to show them that they were not alone, to bring them together and enable them to grow. Amidst the competing world, it can be easy to forget those radically powerful moments of real human connection that point to something greater. My association with this organization has opened up my eyes to a world where active coexistence, empathy and compassion are possible. MJC is not just an innovative and progressive organization that advocates for honest, committed dialogue and leadership for Muslim and Jewish individuals and communities, aiming to evoke curiosity and interest for intercultural communication and interfaith issues, it is a family, for me it is what the future should look like. 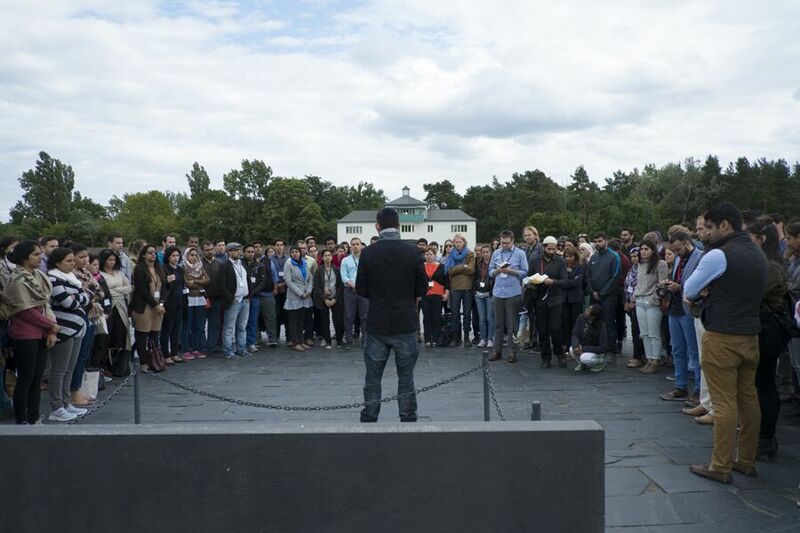 During that week we went to Sachsenhausen Concentration Camp. I can not even begin to put to words what I experienced being there. As the Muslims, Christians, Hindus, Buddhists present there shared the pain and tears with their Jewish peers, as the Muslim, Jewish and Christian prayers were recited for all those lost lives, we all became one. That is the moment I knew that all those experiences, adventures, mistakes and learning points that have taken me through the depths of pessimism and the heights of hope over the past few years, have led me here, here to this life altering moment.